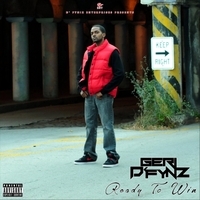 Ready To Win shares a collections of songs that highlights some trials and victories that Geri D' Fyniz encountered making his first music project. It's a soundtrack of tenacity. Nitese Alawn appears courtesy of D' Fyniz Enterprises. All songs were mixed and mastered by Derek "DC" Cannon of Flyy City Media Group LLC at Flyy City Studios Chicago.